NOTE : Every now and then, Paypal seems to have issues accepting payments. If you encounter problems making payments with Paypal, please email me at rohan7679@yahoo.com and I'll resolve it immediately. This training is an update to the Tea and Cookies training. The training covers fairly similar topics such as modeling, shading, lighting and rendering. The primary difference is that instead of Mantra the training focuses on using the third party render engines namely, Redshift, Octane and Arnold. Part 1 of the training will cover modeling and building the entire scene. This will be done using a variety of methods including the basic poly modeling tools, VDB, fluid simulation, POP grains and also some basic copy stamping. Part 2 is available in two variants, for now, Redshift and Octane. This part will focus on lighting ans rendering the scene. However the primary focus is on building all the various shaders required for the scene. We'll build a majority of the shaders using procedural textures. The training will also cover SSS, displacement and building fluid shaders using absorption. We will also build relatively detailed metal and plastic shaders. 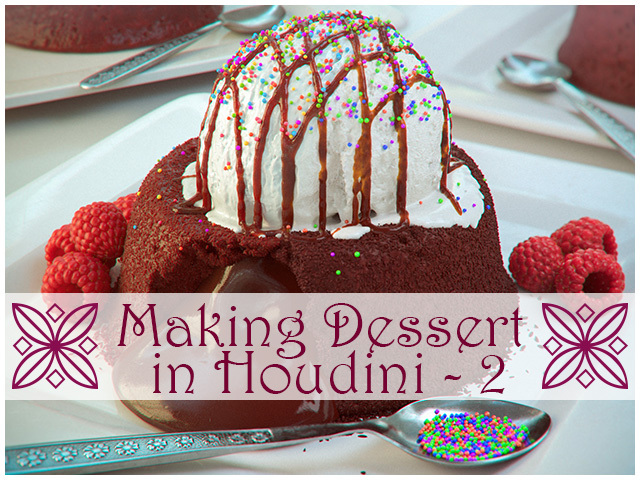 REQUIREMENTS - This training requires Houdini Indie or Houdini FX. Houdini apprentice will not work since it doesn't support 3rd party renderers.